If you teach an easily-distracted piano student then you likely know how frustrating it can be to try to make a lesson flow smoothly. But the frustration doesn’t end with you. Easily-distracted students are often very frustrated by their own busy brains and the comprehension challenges that arise as a result. We’ve blogged in the past about strategies for teaching fidgety students, students with ADD and ADHD and students who simply need to change focus frequently. 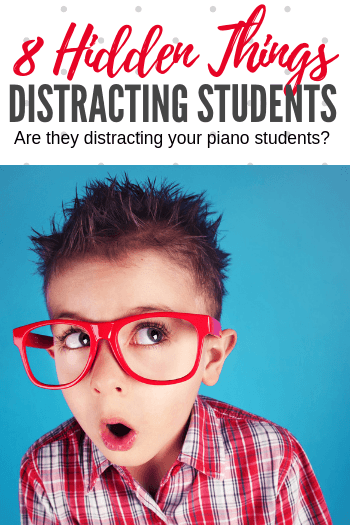 If you have a piano student who is having difficulty focusing, it’s a good idea to look for ways to eliminate potential distractions as much as possible. Removing obvious distractions (your dog, a ticking clock, a hummingbird feeder) is easy to do, but today’s post is about those things that are not so obvious… and I call them “hidden distractions”. Hidden distractions often go unnoticed by a piano teacher but scream out at piano students. Unfortunately, since children often have difficulty recognizing and verbalizing learning needs, instead of simply stating “That “thing” is bothering me” they instead display a variety of undesirable behaviours. If you’re dealing with an easily-distracted student or one who is acting out during lesson time, take a look to see if these covert distractions could be part of the problem. Using a visual calendar that is displayed and discussed at the start of a piano lesson helps to set students up with clear and comfortable lesson schedules, helps to pre-warn students of any variations, and helps to prevent students from having to fret about what may or may not happen during a lesson. Well-meaning parents of easily-distracted children will often promise rewards or treats to encourage “good lesson behaviour”. 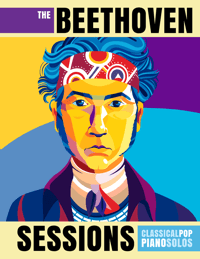 Studios, mine included, may have systems such as “Beethoven Bucks” or studio prize buckets to encourage regular practice. And while these strategies might work great for some, they should be used cautiously with others. If not explained thoroughly, reward systems can create distracting thoughts of what the reward may be, if the reward will actually be received, and the feelings that will result upon failure to achieve a reward. For easily-distracted students, aim for motivating without pre-promising anything, opting instead to reward or acknowledge desirable behaviour as it happens (not in the future). Most piano students love to please their teacher. But for some, the desire to avoid making mistakes, or the fact that they could possibly disappoint you, causes overwhelmingly distracting thoughts that then result in a lack of focus… which causes mistakes… which further reinforce their worries. Create an atmosphere where mistakes are not only tolerated, but are celebrated as a very welcome by-product of taking on challenges. Check out this “mistake friendly” blog post for more ideas. As an important adult figure in their lives, your students are often waiting for days to tell you about exciting events that may have happened during the week. Without the chance to tell you their stories they may spend their entire lesson waiting for an opportunity to do so (and that’s all they’ll be thinking about). Some children crave a challenge and take on the opportunity to work towards a goal with zeal. For others, the perception of too many steps to success can be overwhelming and distracting. This can cause them to shut down, not pay attention or simply give up before they even begin to try. Keep your verbal instructions simple, and to just one or two steps. Ensure that you set many quickly-attainable goals both during lesson time and when looking at “big picture” plans. I’m the queen of multi-tasking, but when I have an easily-distracted piano student on my bench I force myself to do just one thing at a time. 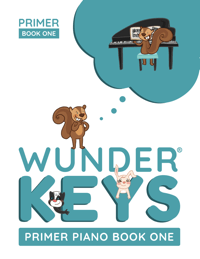 Writing lesson notes while your student plays or setting up a piano game while they complete an assignment page can all be very distracting to some students. 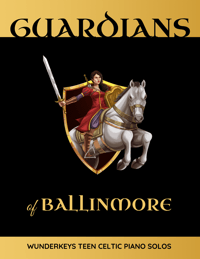 If you know you will be teaching a student who needs your undivided attention ensure your materials are all within arms reach, and that they are set-up but out of sight. Find a simple way to communicate lesson notes that doesn’t require a lot of writing during lesson time and avoid being distracted yourself. Distracted children can also be anxious children who find uncertainty unsettling. Students who are unsure of lesson expectations in terms of behaviour often “test the waters” and if your reactions are not the same each time they can fall into a distracated spiral. 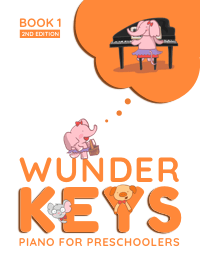 Clearly verbalize your expectations (ie “When I’m talking, you are not allowed to play the piano.”) and react in the same fashion every time expectations are not met (closing the keyboard cover if your students insist on playing while you are talking). Predictability is key in keeping your students’ focused on learning. Some kids can “power through” a lesson no matter how hungry, tired, or thirsty they may be. Others are completely distracted by even vague sensations of physical discomfort. Work with the parents of your students to ensure their kids are properly fed, appropriately dressed, hydrated and “bathroom’ed” before their lesson time. If this is a time-constraint issue (ie. arriving immediately after soccer practice) work to adjust their lesson times in future years to avoid what could be causing the discomfort. A simple adjustment in schedule can make a wold of difference to a child who is keenly aware of sweaty clothes or the need for a snack. 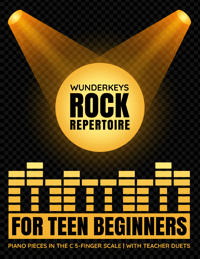 Need to grab the attention of a distracted student with super-exciting piano repertoire? 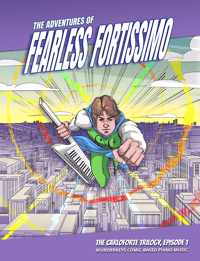 Check out The Adventures of Fearless Fortissimo on Amazon! 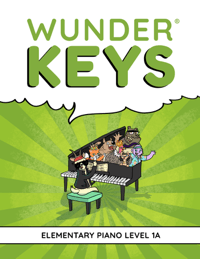 These booksBam, the Zzzwap, and the Kapow for teaching children who crave action to love piano lessons!